The Great Recession of 2007 and 2008 complicated the economic growth and progress of cities around the country. But for Chicago’s New York Life Insurance Building, it may have been the Hail Mary needed to save the 1894 structure from destruction, once and for all. In 2005, The Hamilton Partners and Lucien LaGrange had designs to build a 52-story high rise overlooking the 14-story New York Life Insurance Building. The new construction would require partial demolition of the historic William Le Baron Jenney building. Referred to as the “Father of the American Skyscraper,” William Le Baron Jenney is often credited as the inventor of the entirely metal-framed buildings. 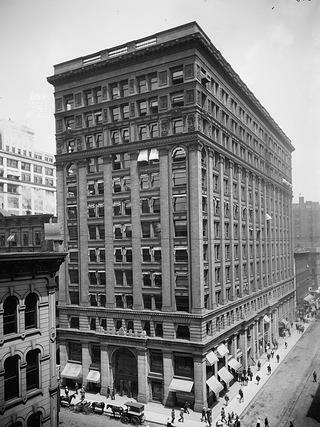 Between 1883 and 1903, he designed the New York Life Insurance Company’s Midwest headquarters in Chicago’s Financial District. Built in the Chicago School style of architecture, the New York Life Insurance Building is one of three neighboring Jenny-designed structures on La Salle Street and features design elements unique to its time, such as terracotta detailing on the facade and expansive marble, which are still visible today. Despite the building’s extensive history, the allure of taller and more modern buildings almost overtook the importance of maintaining one of Chicago’s historic structures. The building retains almost all of its exterior features except the cornice, likely removed in the mid-1900s. For the New York Life Insurance Building, its ultimate future would not be determined for much of the early 21st century. Working with the newly incorporated Preservation Chicago, Miller and other advocates pushed the city to landmark the structure and placed it on Preservation Chicago’s “Most Endangered” list in 2003 and 2006. Finally, later that year, the city named New York Life Building a Chicago Historic Landmark; however, a prolonged tolling agreement left the preservation community waiting with bated breath. Out of imminent danger, the New York Life Insurance Building retained its tenants, though the necessity for a long-term, responsible steward grew increasingly apparent. 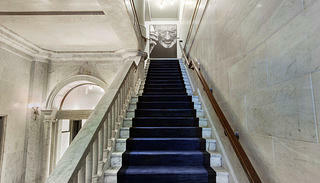 The Gray has 293 rooms with interior design by the firm Beleco. At the time, Kimpton Hotels and Restaurants Group already had four hotels in the Chicago area, including three in historic structures. 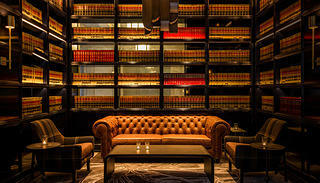 “When we saw the beauty of the building, the historic significance of the building and knowing that we were in the main financial district of downtown, we said to ourselves, ‘We can’t let this opportunity get away,’” says Nabil Moubayed, general manager at the newly reimagined New York Life Insurance Building, now Kimpton's The Gray Hotel. Kimpton officially acquired the building in 2014. With a budget of over $100 million (including historic tax credits) and the help of Gensler architecture firm, Kimpton oversaw work to expose the original marble from underneath laminate and carpet; clean smoke-stained marble walls; carefully tuckpoint exterior brick and terracotta; and remove, repair, and reinstall hundreds of historic windows. After two years of work, Kimpton’s The Gray at 39 La Salle Street opened in August, lauded as a resounding success. "It's almost Mad Men-like," says Moubayed of the bar atmosphere. "It's very authentic." Today guests and locals alike can enjoy the historic ambiance of the hotel including Moubayed’s favorite space, the bar Vol. 39, which is lined with dog-eared and Post-it-tagged law encyclopedias that the construction team found during the office-space demolition. Kimpton’s decision to capitalize on the New York Life Insurance Building’s location in the Financial District—not far from the Loop neighborhood—is seeming less and less unique. “There is actually a community starting to form, which we are really excited to be a part of,” says Moubayed of the conventionally business-oriented neighborhood. Just last year the Hyatt Centric the Loop Chicago, featuring a rooftop bar, opened around the corner in a 1927 art deco office space. And one of Chicago’s hottest new food destinations—Revival Food Hall, located on the ground floor of a 1907 Daniel Burnham-designed building—is less than a block away. “The downtown as a whole is coming back to life,” says Mary Lu Seidel, National Trust senior field director of the Chicago Field Office. As Chicago’s downtown flourishes, the New York Life Insurance Building has been reborn as a testament to the history of construction and design and the importance of adaptive reuse for urban communities. "We are all very proud parents of a new Chicago treasure," says Miller.